This modern hotel is within a 5-minute underground ride of Munich Main Station and the Oktoberfest beer festival grounds. It boasts spacious rooms, outstanding cuisine and a hotel bar offering snacks and drinks around the clock. 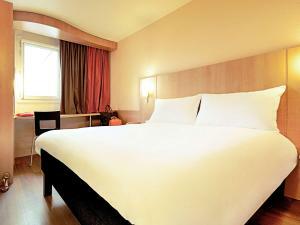 The air-conditioned rooms at the Ibis Hotel München City West await guests with fresh design and modern comfort. Every room includes a flat-screen TV, desk and private bathroom. The Ibis München City West offers a free internet terminal with printer in the lobby and a 24-hour reception. Free WiFi is available through out the entire hotel. A breakfast buffet is available from 04:00 until 12:00, and is served on the terrace in summer. The Restaurant Ibis Kitchen Pasta & Grill has a show kitchen and serves international specialities from 18:00 until 22:30. There is a tram stop and Westendstraße Underground Station and a bus stop right outside of the hotel. The hotel has its own parking garage.